On Saturday, March 16th, 115 volunteers showed up at the U.S. Army Corps of Engineers Visitor Assistance Center to participate in Clean Jordan Lake’s event in support of the Haw River Assembly’s annual Clean-Up-A-Thon. Each year, the Haw River Assembly organizes hundreds of volunteers who do a wonderful job of cleaning trash all along the Haw River. Clean Jordan Lake has participated for the last four years, focusing their effort on the shoreline where the river forms the lake. This year, our volunteers cleaned about 2 miles of shoreline stretching from the Poe's Ridge Boat Ramp to the face of Jordan Dam as well as a popular fishing spot on the bank of fast-moving water behind the dam. They collected nearly 450 bags of trash, enough to fill two dumpsters provided by Chatham County’s Solid Waste & Recycling Division of the Environmental Quality Department. 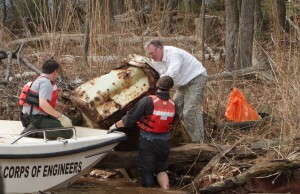 The Army Corps of Engineers provided boats to ferry trash to the dumpsters, with assistance from several boating volunteers. In addition to 143 tires, several large propane tanks, a container full of lubricating oil, and a large refrigerator were removed. 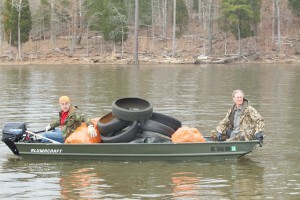 Most of the length from Poe's Ridge Boat Ramp to Jordan Dam had been cleaned before by our volunteers in previous HRA events held in March 2010 and 2011, so it was interesting to see how much trash had entered from the Haw River since then. The bag total for this area was still quite high, perhaps over 300, but the tire count was less than 25, compared 278 in previous events. The reduced tire count may be related to a switchover several years ago from charging tire dealers to dispose of tires to a disposal tax paid by customers buying new tires. This has reduced illegal tire dumping, but the bag count indicates that general littering in the watershed continues. 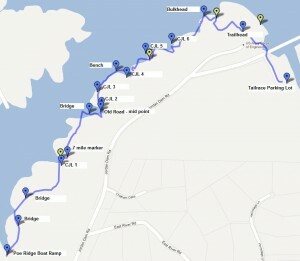 This year's event saw far greater participation by kayakers. About 15 of them paddled over to Wilderness Island to walk the shoreline of a section just north of the tip and readily accessible only by boat. Most of the tires came from this area. Our boater motored over to pick up the trash and bring it back for unloading. A new feature of the cleanup this year was a trash treasure hunt. Three of the five selected items that had washed up on the shoreline in storm flows from the Haw River were found. Successful trash “treasure” finders claimed prizes of day packs donated from REI and a gift certificate from Great Outdoor Provision Co. While not a Trash Treasure Hunt item, one volunteer found a bottle with a note in it, dated 2002 and the volunteer wants to contact the sender. 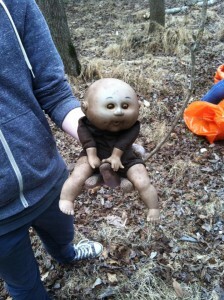 Other weird items included a cabbage patch doll with a hideous look.